in recent years, MSNBC political analyst Rachel Maddow’s assemblage of footage of conservative lawmakers trashing the president for his huge stimulus bill while benefitting directly from it (play above). It is the kind of reality check Maddow does so well and the White House does so poorly. Regardless of what you think about this president, I think it is difficult to not agree the Obama Administration is terrible at messaging. The loudest and most effective voices in political discourse today are those of conservatives. The White House is simply inept at punching back and has never, to my memory, seized the agenda. All they do is respond to conservative attacks. Eventually. Sort of. This obviously makes the White House—and, by extension, Obama and all Democrats—look weak. Democrats now openly and brazenly criticize him, rats jumping off a sinking ship. In a useless effort to distance themselves from the Obama Titanic, many Democrats have taken to pandering to the conservative fringe, further empowering the Statue of Liberty Foam Hat Crowd. It is a ridiculous political strategy. Conservative are not going to support these Democrats either way, and progressives are going to stay home or, at least, not vigorously support these two-faced, disloyal opportunists. The conservative right’s biggest asset is also it’s biggest vulnerability: its pandering to ignorance. I realize some of this doesn’t qualify as pandering, some of these people truly are ignorant. Their obstruct-and-then-blame strategy, however, wins them only the loyalty of the least informed as most anyone with a sixth-grade education can do the math: conservatives have rope-a-doped this president, blocking or marginalizing his every effort to halt America’s Bush-initiated economic spiral while successfully blaming Obama for his failure to halt it and for the decline itself. I have no idea why the president seemed, from day one, so completely unprepared for the savagery of Republican obstructionism and lack of respect for his office, beginning with the Supreme Court Chief Justice John Roberts’s flubbing of the presidential oath of office. The new president apparently naively expected politicians would put country ahead of politics. The most heinous evil foisted against this country during this generation is not Osama bin Laden but the truly evil men and women who exploit every human tragedy for personal and political gain. These men and women could not possibly care less about America or Americans. They want Obama out. Period. And they’re more than willing to destroy America in the name of saving it. It further amazes me that mainstream America can’t read that play. America has traditionally blamed the president for hard times, but we are blaming the wrong president. People losing their jobs, their homes, and ultimately their human dignity, are too emotionally distraught to see the forest for the trees. The GOP mantra includes claiming the $800 billion 2009 stimulus package did nothing for America, which is a heinous lie. The same politicians making that claim have pocketed billions in cash and created or saved tens of thousands of jobs in their own states. Were it not for the extension of unemployment benefits, America would have been reeling much, much harder and, perhaps, would have a clearer sightline to who is extending help and who is obstructing it. The truth is, this recession is much more like a mild, Not-Great Depression. An Okay Depression. The truth is, Obama’s economic policies, whatever you think of them, have rounded the edge off of what is a much greater national tragedy. As bad as it seems, it is actually exponentially worse. Bailing out the auto industry, which the Republicans opposed and still gripe about, saved perhaps millions of jobs. Keeping interest rates low, extending unemployment benefits, and billions in cash to state and local governments have injected nearly a trillion dollars into the stalled economy. This has not made the economic situation better, but has kept most Americans from feeling the full burnt of what is actually taking place not only in America but globally; things that are neither this president's fault nor are, for the most part, within his scope of authority to control. The president's policies, like them or not, have cushioned the blow for enough Americans to grow this incredible and stupid tide of discontent now sweeping the nation, blaming the president for the European Sovereign Debt Crisis, disasters in Japan and Pakistan, revolutions in the Middle East and other external factors crippling America’s fragile economic recovery. The Republican propaganda force is extremely effective and the White House Communications Office has apparently been on sabbatical for three years. It is simply unfathomable why Obama can't get his message out, why he cannot or will not remind the American public of the good he has done, or why he cannot efficiently disseminate simple facts: were it not for the swift and aggressive action of this president, we would now likely be into a Second Great Depression. The very same people bellyaching at this president are cashing Social Security and unemployment checks the Republicans would have taken from them a year ago. It is also likely that, for every family losing their home, there's a family keeping theirs because of the president's aggressive action to keep interest rates low and strong-arm banks into working harder to prevent foreclosures. But we never hear those stories. We hear Obama Has Failed. 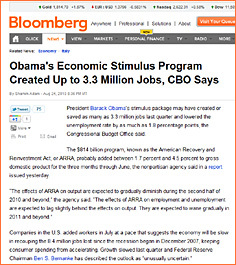 The Stimulus Created ZERO Jobs. And, much as I enjoy demonizing the conservative right, I believe the president has indeed failed, and grossly so, to communicate effectively with America and counter the relentless deluge of provable lies spewed day and night from people more concerned with political wins than in saving the nation from disaster. Like Roberts, like Wilson, Obama should embarrass these people (click to play audio). Not debate them, not engage them, shame them. The president should be running an aggressive Campaign of Shame. This is the president's chief virtue and chief deficiency: his distaste for aggression and confrontation. It's why we're in this mess and why he's in his. Had this president acted in a politically partisan fashion, he would have rammed his agenda through Congress early in his term when he held majorities in both houses. And, from my chair, his not doing so was Obama’s greatest failing as president: to not immediately and vigorously defend the nation, politics be damned. This is the progressives’ main ax to grind: that we hired the man to do a job, not to make friends. I applaud the president's efforts to change the way things are done in Washington, but that was not his mandate. Get the "president" part done first. Part of the disrespect shown uniquely to this president is indeed racial but part of it is Obama himself. The mealy-mouthed courting of evil and self-serving people violated the trust with which so many of us endowed Obama. He should have known, or at least arrived in office prepared to accept the fact, that his would be a single-term presidency and should have pursued his agenda with fire. In that light, our deepening national crisis is indeed the president’s fault, for having wasted so much time and so many opportunities pursuing, literally, a single Republican vote for his policies. Obama has done the nation great harm by repeatedly stalling landmark legislation vital to the national interest, bills which would have sailed through Congress on party-line votes, while he negotiated with disingenuous liars interested only in running out the clock. As comedian Bill Maher aptly put it, Obama, “…put bipartisanship ahead of fixing the country.” That’s why we’re in this jam, and that’s why Obama is in his. The nation’s future is in the hands of White America. The novelty of the first black presidential nominee is well behind us, now, and Black America harbors muffled discontent at the administration’s seeming indifference to their dispro-portionate economic suffering. Which isn’t to say we won’t support the president, but the house-on-fire urgency of 2008 is long gone. The Republicans are unlikely to nominate anyone who will be in any way attractive to Black America, so the only real question is how offensive an Uncle Fester the GOP will pick. They simply don’t have anybody yet who would beat Obama in the general if the economy wasn’t in the tank. And these nutty cartoon characters the GOP keeps rolling out consistently put their feet, both of them, in their mouths. They are offensive not only to black people but to thinking people, many of whom will simply hold their nose and choose the devil they know rather than roll the dice with one of these buffoonish ideologues. This is, perhaps, the only campaign strategy left to the president: hope the GOP nominates a nut. 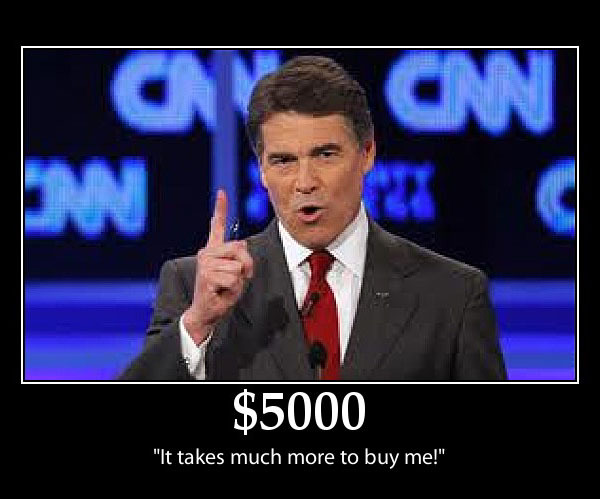 Clip From The Rachel Maddow Show Copyright © 2011 MSNBC. All Rights Reserved. What began as a significant economic slowdown in the beginning of 2001 became a rout after September 11. The U.S. economy was in a full-blown recession for the first time in a decade, which has caused fiscal and monetary stimulus to be applied in doses not seen in a generation. The year began with Alan Greenspan cutting the federal funds rate by half of a percentage point on January 3 (see Figure 1). This was a surprise because it occurred between FOMC meetings and it was a large cut in the fed funds rate. It certainly caught everyone’s attention. Despite the fact that the U.S. economy continued to grow at a respectable 2% in the last quarter of 2000, the Federal Reserve had sufficient inside information that the economy was headed for a recession and immediate actions were needed. The Bush administration was able to get Congress to pass a major tax cut. However, other than a one-time rebate of $300 - $600, most of the cuts in taxes would not occur until five years out or more. Thus the tax cut was more of a ‘promise’ than a reality. The argument for the long delay in the realization of the tax cuts was that we had to wait and see if the surpluses would persist for years or would be a temporary phenomenon. Then the roof caved in on September 11, 2001. The terrorist attacks on New York City and Washington D.C. were the types of shocks that economists could never dream of. An era of fear and uncertainty unknown since the Cuban missile crisis took hold of America and the world. The consequences of this terrorist attack are only now being determined. The major effect on the economy from the terrorist attack is the creation of tremendous uncertainty about the future. It is this uncertainty that is wreaking havoc on the economy.